This was the year of the wreath for me. 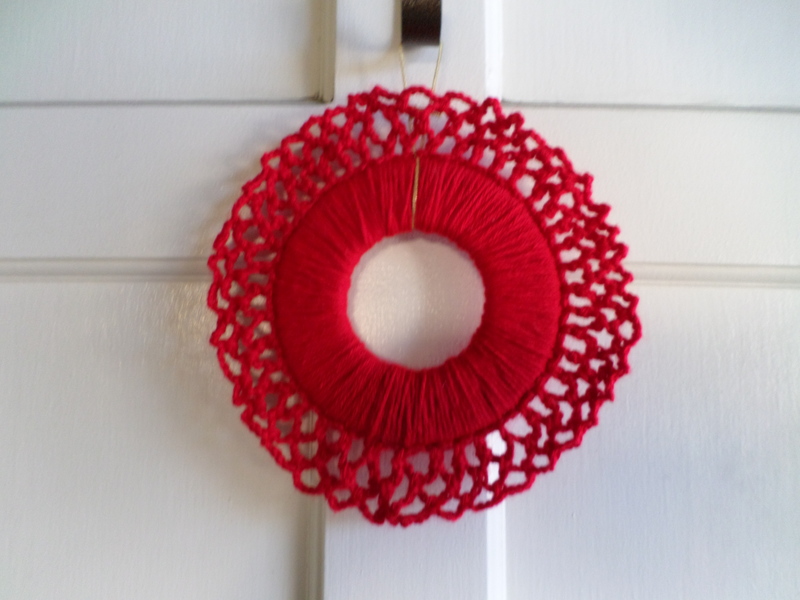 I loved the “Simple Statement Wreath” from Lisa Gutierrez of goodknits.com from the moment I saw it on Pinterest. 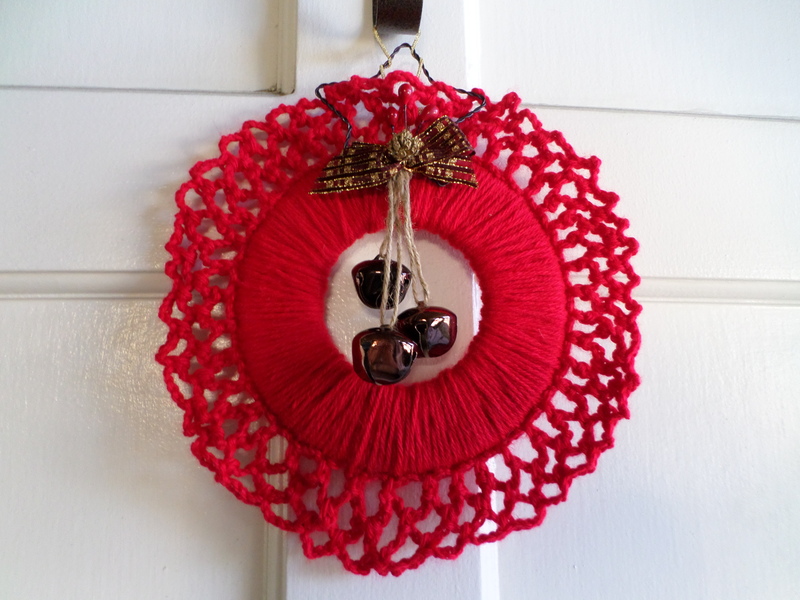 The wreath calls for bulky yarn but I used Carron Simply Soft in red which I had on hand, and it still worked up really quickly with a size I hook, and didn’t use that much yarn. 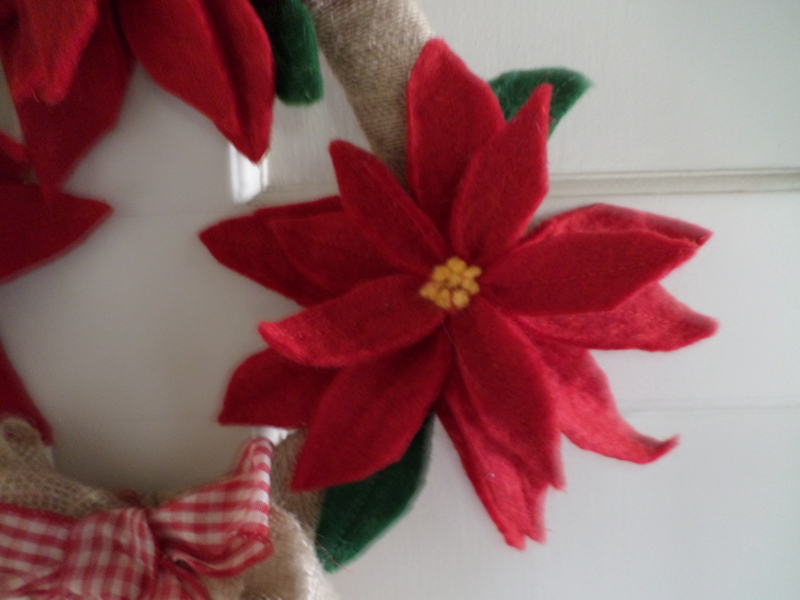 The tutorial shows a rounded foam form but I just used a cardboard form like the one I used in my poinsettia wreath. 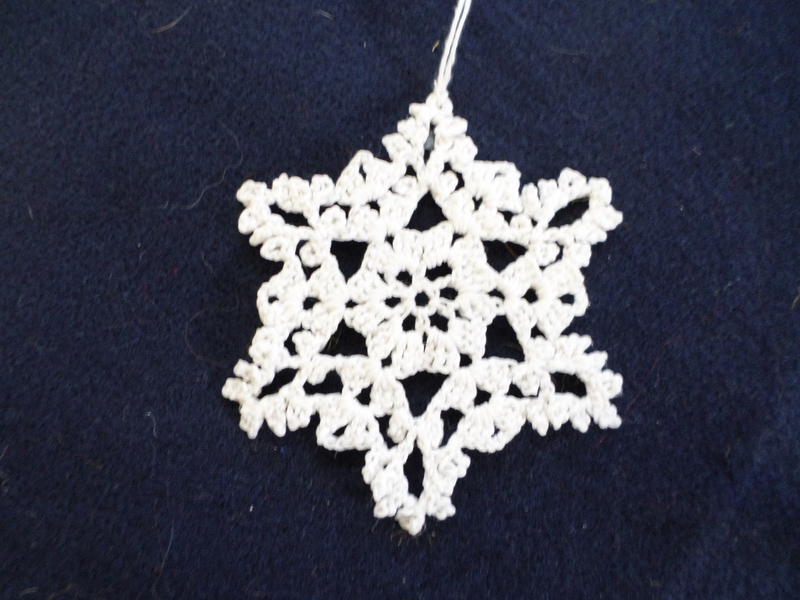 I made 3 rounds of the border lace as that’s my favorite part. Then I decided to use bells for embellishment. 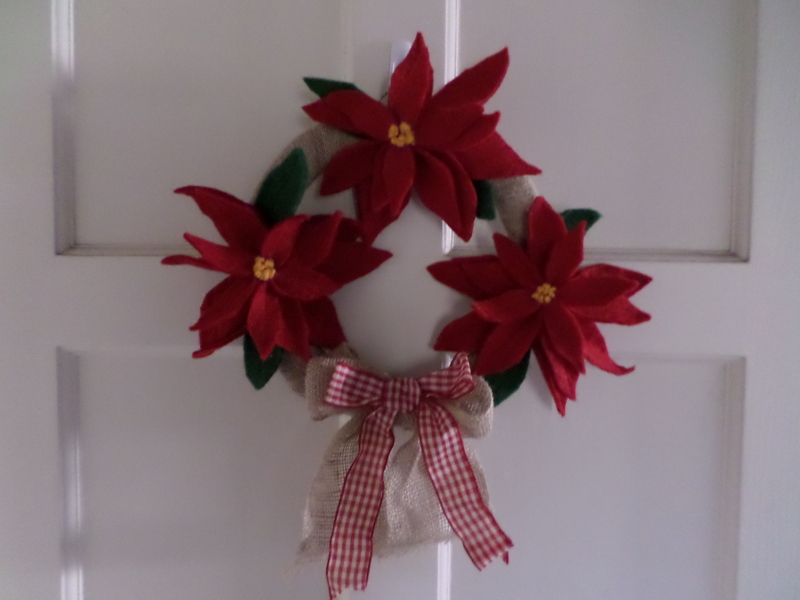 Maybe next year I will make two more so I can have a trio including possibly a larger wreath in metallic gold thread. I can also picture tiny ones to hang on the tree. 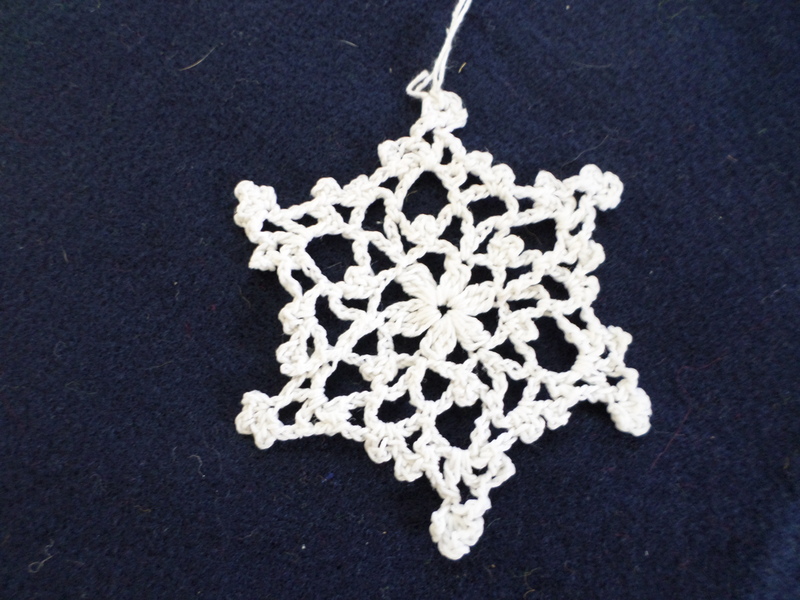 This is a clever pattern, and the free tutorial is clear and detailed. 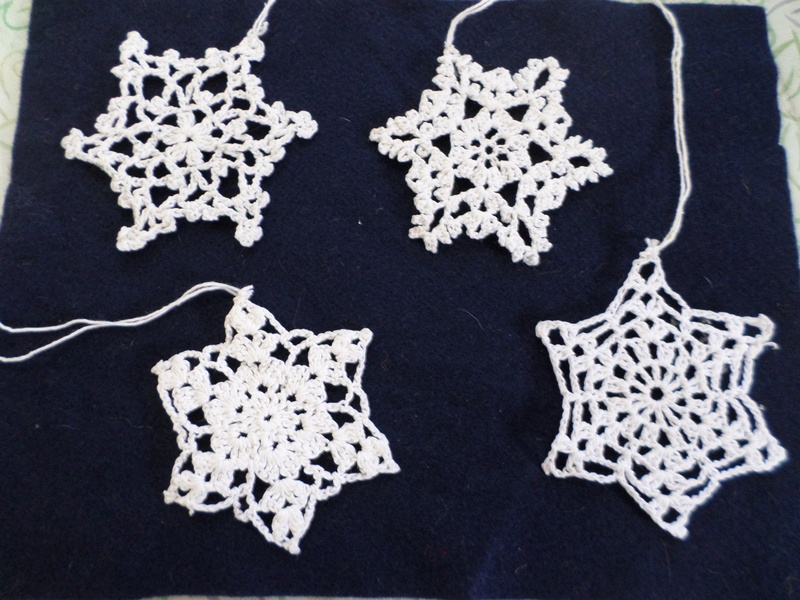 I have long admired crocheted thread snowflakes, but I found them too difficult for me to make when I tried crocheting them in the past. 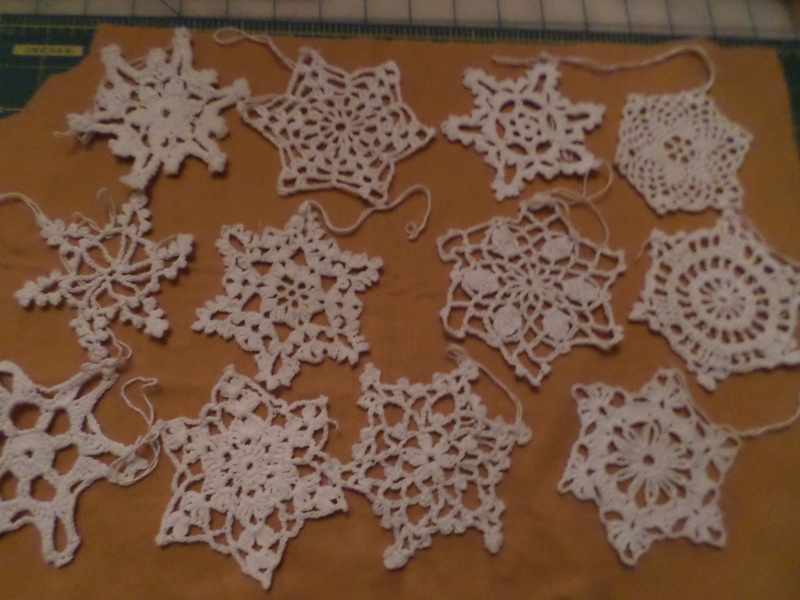 So I snapped up this set of twelve different handmade and stiffened snowflakes that I found at the Goodwill bookstore near me. I paid $3 for all twelve. They’re intricate and lovely! This entry was posted in Crochet and tagged christmas wreath, crocheted snowflakes, crocheted wreath, crocheted wreath tutorial, goodknits.com, Lisa Gutierrez, simple statement wreath on December 25, 2013 by Stitch It Again. I love seeing the Christmas flower, the poinsettia, everywhere this time of year. This holiday season my crafting vision was to make a wreath celebrating this flower’s beauty from simple natural materials. I started with a store bought cardboard form, a strip of burlap, and thick wool felt. 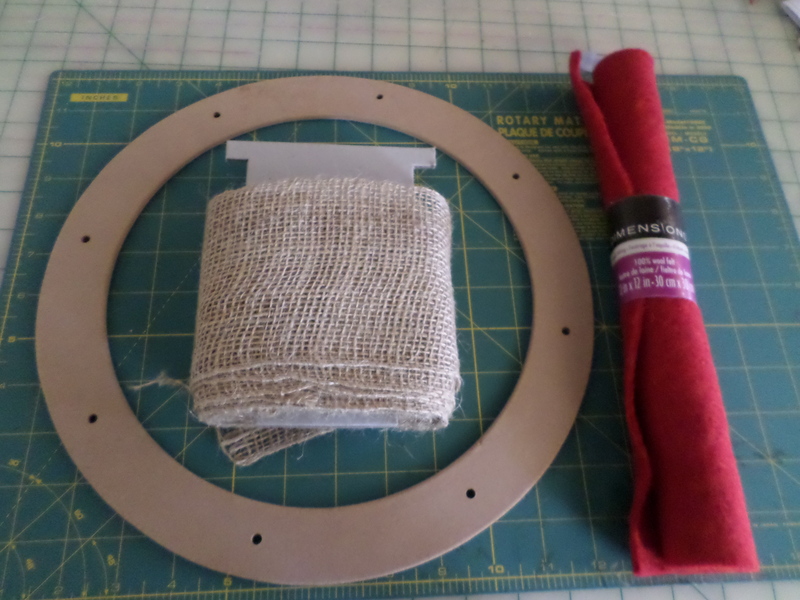 I began by wrapping the burlap around the form and securing it with a few staples. I made 3 different sized petal templates for the flower. I machine stitched a line down the center of each petal, although in retrospect I could have skipped this step. 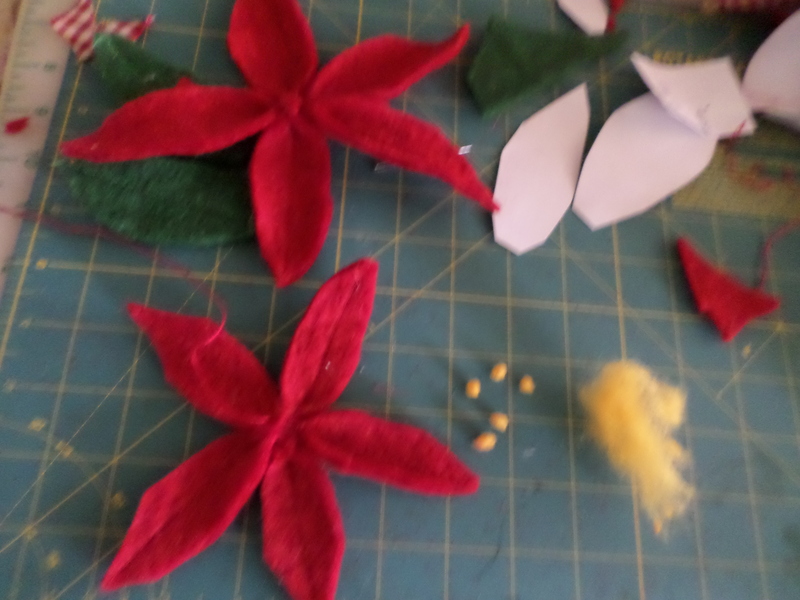 When I began hand sewing the petals together, I discovered that the flower came together best when I sewed each layer of five petals together separately, and then attached the three layers together. I added a few green leaves. For the yellow flower centers, I pinched off small pieces of wool roving and rolled them between my fingers . 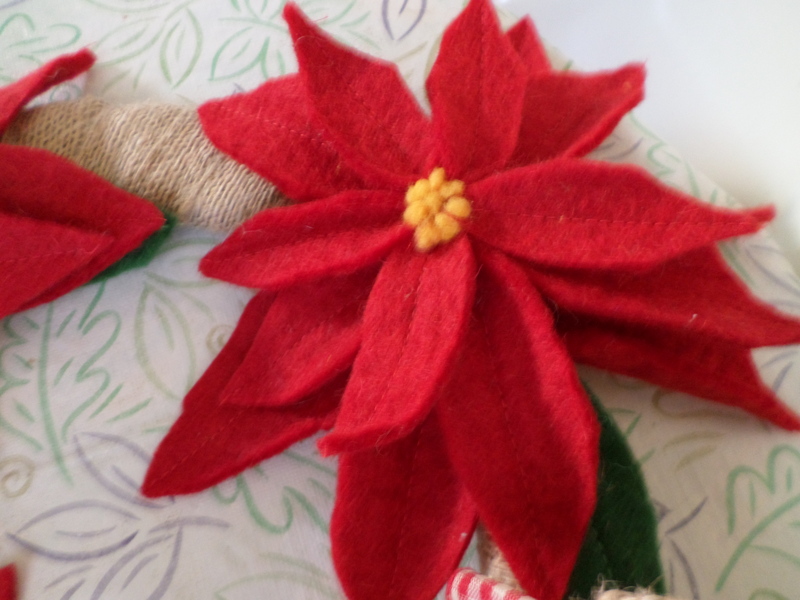 I used two squares of the red wool to make three flowers. 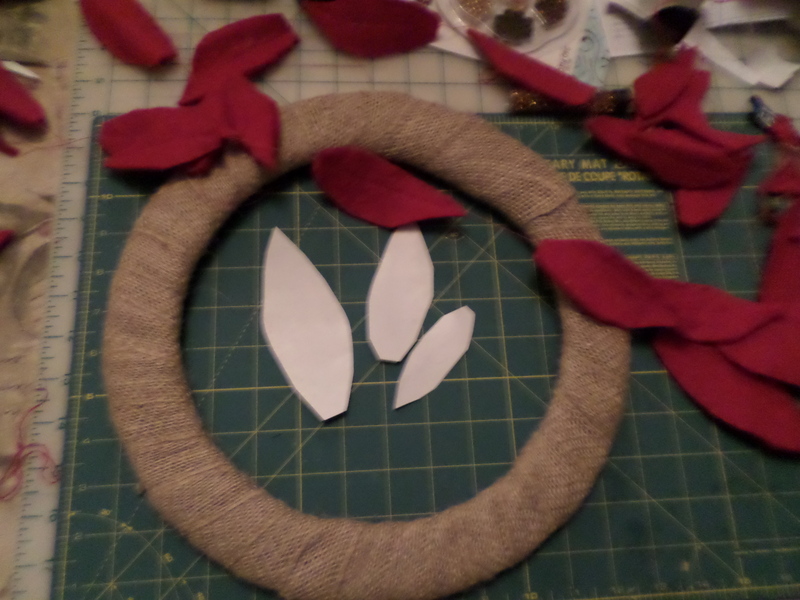 Then I decided on the flower placement that appealed to me and attached the flowers to the burlap wreath with wire. I added a burlap bow and a rustic red and white plaid bow on top for additional decoration. The wreath was fun and simple to make, and these spectacular blooms will last and last adding beauty and color to any wall or door. 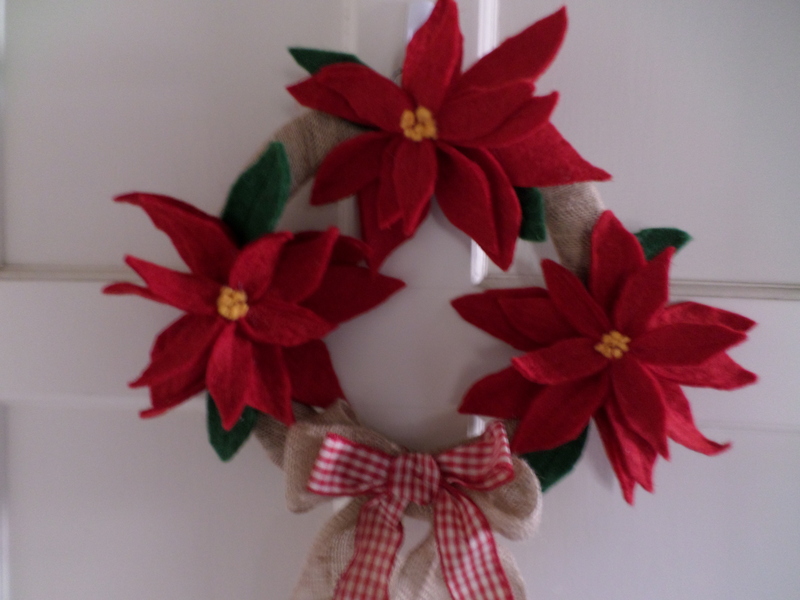 This entry was posted in Crafts, Uncategorized and tagged burlap wreath, christmas wreath, felt poinsettia flower, poinsettia wreath, wool felt wreath on December 14, 2013 by Stitch It Again.